Georgia O’Keeffe at Prospect Mountain, Lake George, in 1927. In 1927, Georgia O’Keeffe’s first major solo exhibition opened at the Brooklyn Museum; 90 years later, a sweeping survey of her work has now returned to the same institution, with an eclectic mix of materials that includes the artist’s high-school yearbooks, bespoke suits, and Vanity Fair–commissioned illustrations. The Brooklyn Museum introduces the exhibition “Georgia O’Keeffe: Living Modern,” which opened March 3, first in its foyer, featuring striking photographs of O’Keeffe taken by modernist legends Cecil Beaton, Ansel Adams, Richard Avedon, Bruce Weber, Yousuf Karsh, Irving Penn, and Andy Warhol. Nearby, a series of portraits taken between 1917 and 1937 by Alfred Stieglitz, her creative collaborator and husband of 22 years, depicts the artist as a self-possessed, somewhat elusive person. 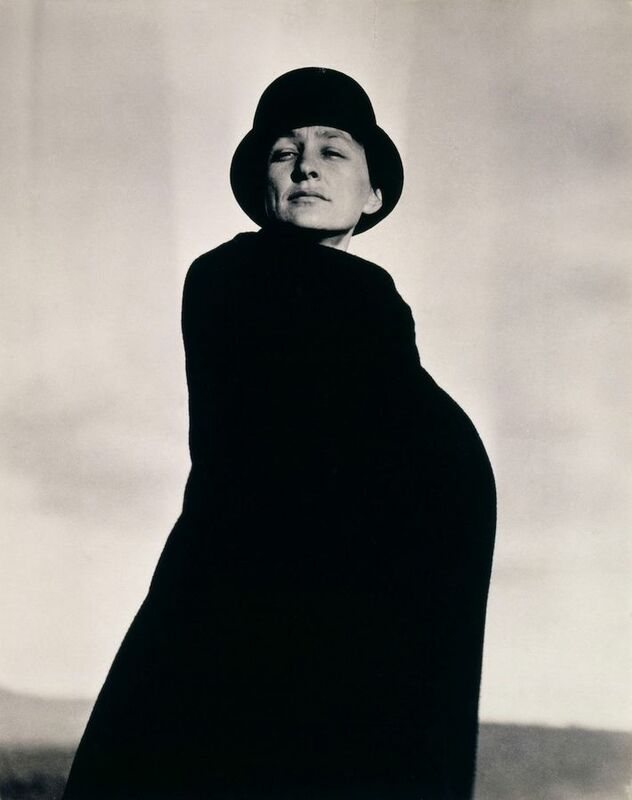 Her white silk separates, brimmed gaucho hats, and silver bangles are shown in real life in the next gallery room, displayed on simple mannequins that “don’t try to evoke the person,” as curator Wanda M. Corn told the Cut, but rather act as a “platform for the costume.” O’Keeffe famously wore loosely fitted, black-and-white suit sets with her hair neatly tucked under a headscarf and vaquero hat. She favored V-shaped necklines, mother-of-pearl buttons, kimonos worn with narrow belts instead of the traditional obi, and items without zippers. Some critics have noted that the streamlined silhouette of her body cloaked in drape-y fabric and a close-fitting cap resembles a Constantin Brancusi sculpture. There is a powerful synergy between O’Keeffe’s style and paintings, both of which show profound geographical influences. For the most part the curators tease out this connection loosely, but at points it crystallizes and is made abundantly clear, when garments are neatly juxtaposed with paintings in the same room. 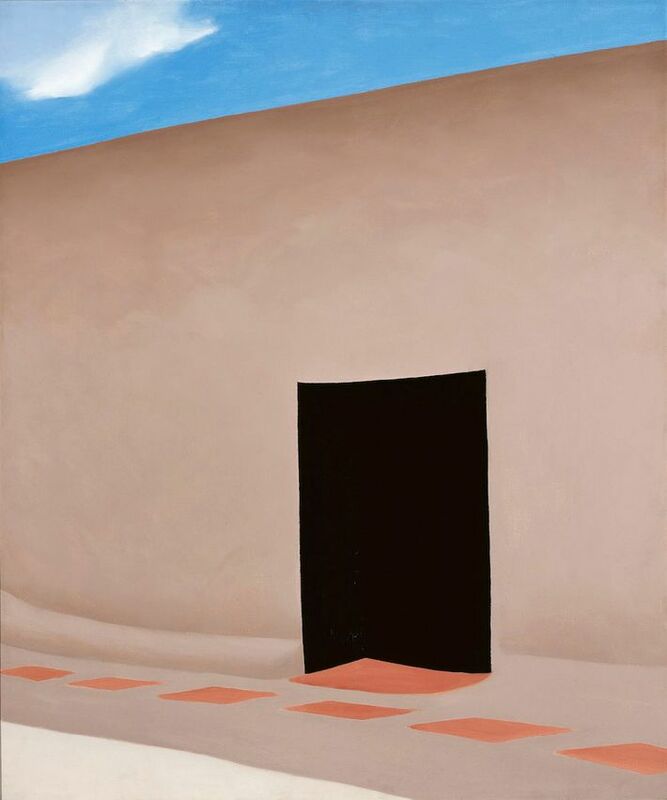 Click ahead to see photos of the artist dressed in her signature black-and-white outfits, as well as O’Keeffe’s vibrant paintings of the Southwestern desert. 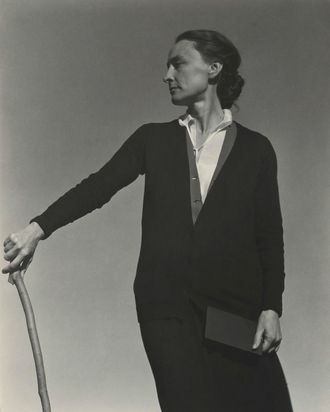 “Georgia O’Keeffe: Living Modern” will be on view at the Brooklyn Museum until July 23. Georgia O’Keeffe, circa 1920–22. Alfred Stieglitz, Gelatin silver print, 4½ x 3½ in. (11.4 x 9 cm), Gift of The Georgia O’Keeffe Foundation. Georgia O’Keeffe, Prospect Mountain, Lake George, 1927. Alfred Stieglitz, Gelatin silver print, 4⅝ x 3⅝ in. (11.8 x 9.3 cm). National Gallery of Art, Washington, D.C.; Alfred Stieglitz Collection. 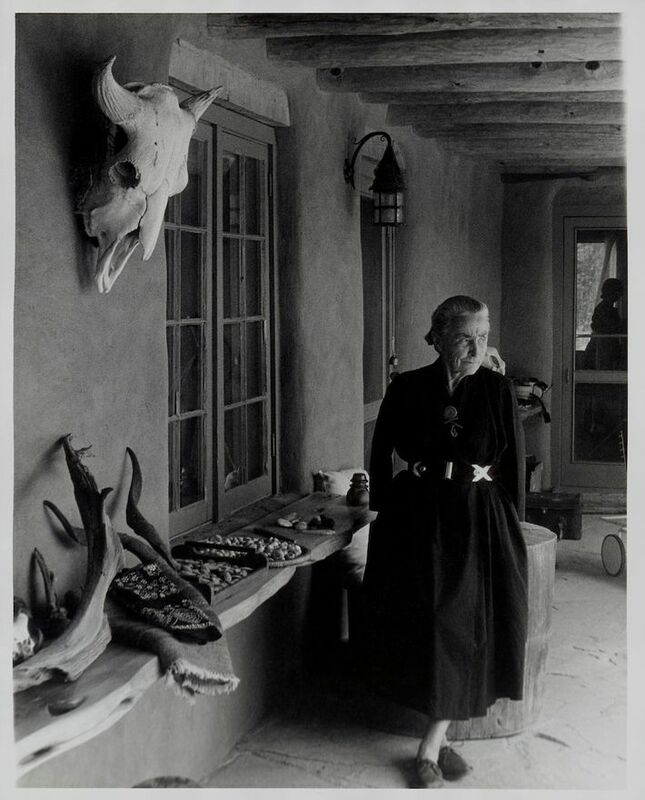 Georgia O’Keeffe on Ghost Ranch Portal, New Mexico, circa 1960s. Todd Webb, Gelatin silver print, 10 x 8 in. (25.4 m). 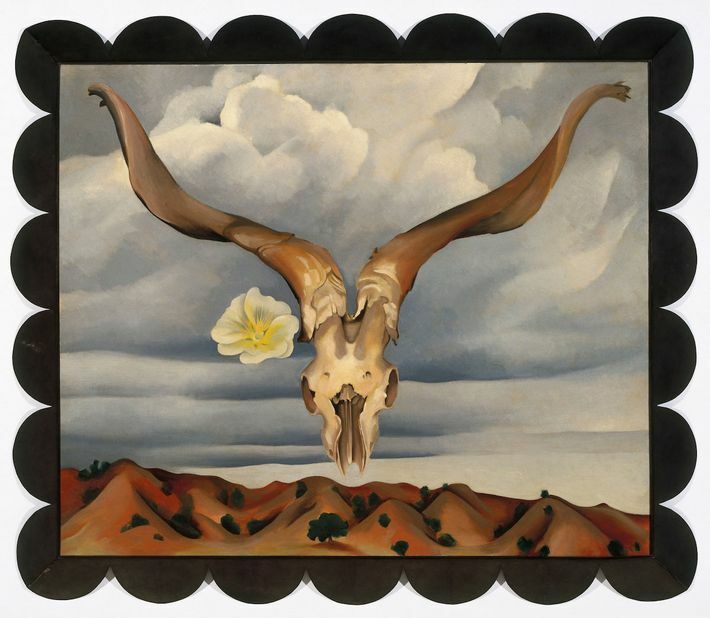 Georgia O’Keeffe Museum, Santa Fe, N.M.; Gift of The Georgia O’Keeffe Foundation. 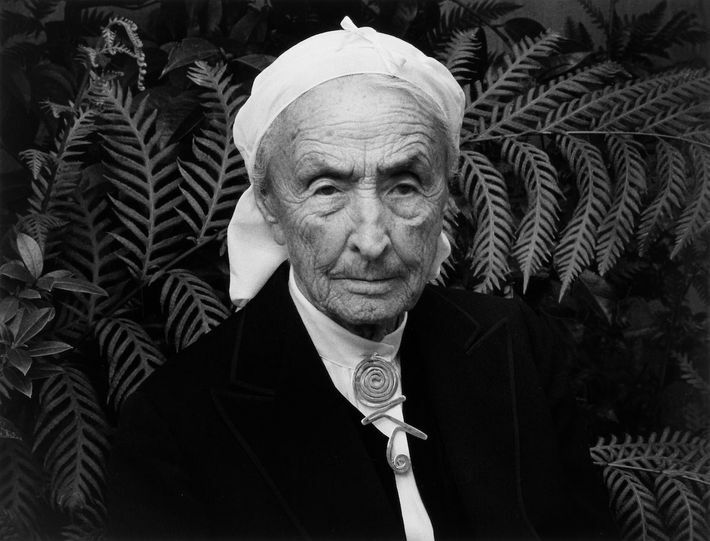 Georgia O’Keeffe, Carmel Highlands, California, 1981. Ansel Adams, Gelatin silver print, 10⅛ x 13⅛ in. (25.7 x 33.3 cm). Georgia O’Keeffe Museum, Santa Fe, N.M.; Gift of Juan and Anna Marie Hamilton. Emsley. 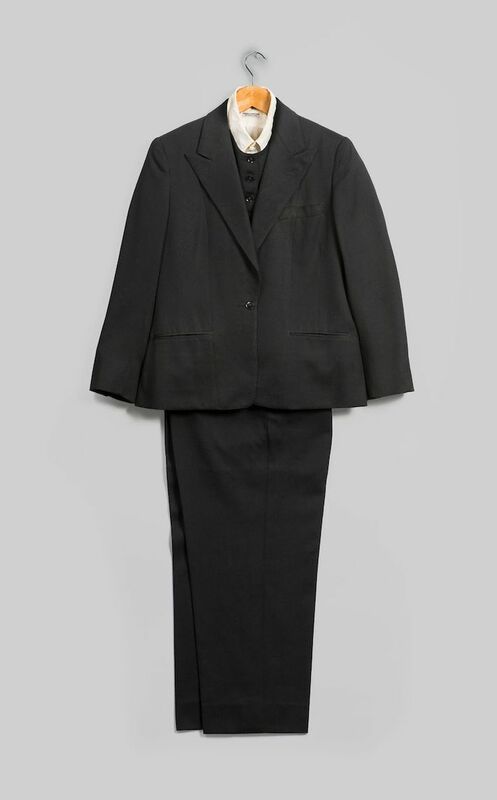 Suit (Jacket, Pants, and Vest), 1983. Black wool. Inner garment: Lord & Taylor. Shirt, circa 1960s. White cotton. Georgia O’Keeffe Museum, Santa Fe, N.M.; Gift of Juan and Anna Marie Hamilton. Attributed to Georgia O’Keeffe. 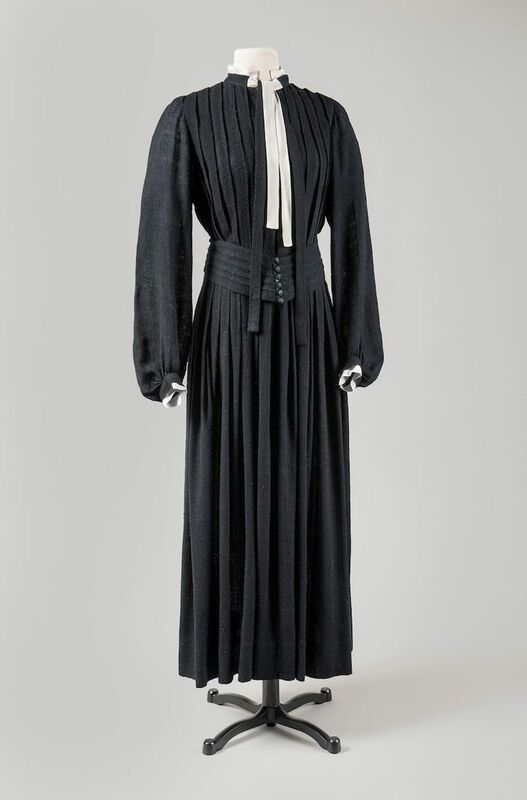 Dress with Matching Belt, circa 1930s. Black wool, crepe and white silk. Georgia O’Keeffe Museum, Santa Fe, N.M.; Gift of Juan and Anna Marie Hamilton. Attributed to Georgia O’Keeffe. 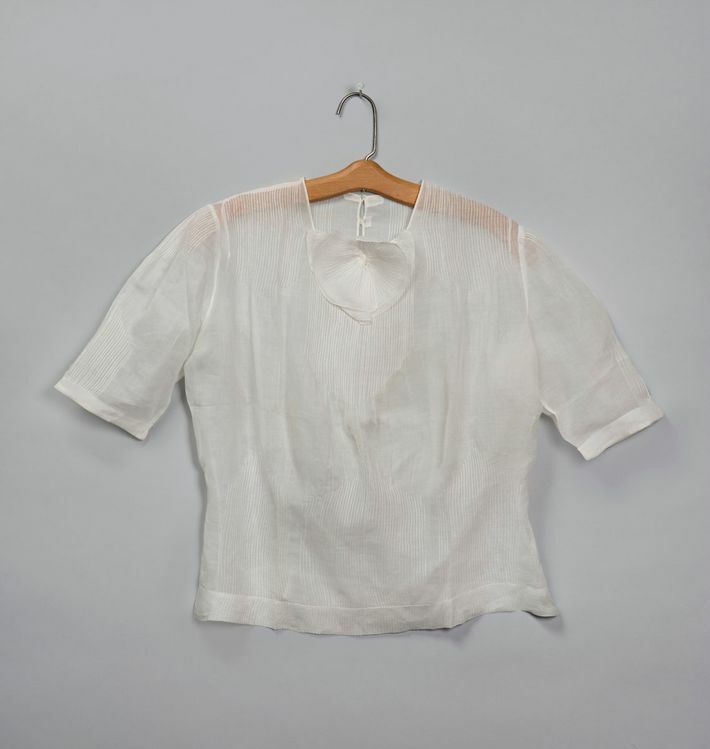 Blouse, circa early to mid-1930s. White linen. Georgia O’Keeffe Museum, Santa Fe, N.M.; Gift of Juan and Anna Marie Hamilton. Ramís Head, White Hollyhockó Hills (Ramís Head and White Hollyhock, New Mexico), 1935. Georgia O’Keeffe, Oil on canvas, 30 x 36 in. (76.2 x 91.4 cm). Brooklyn Museum; Bequest of Edith and Milton Lowenthal. 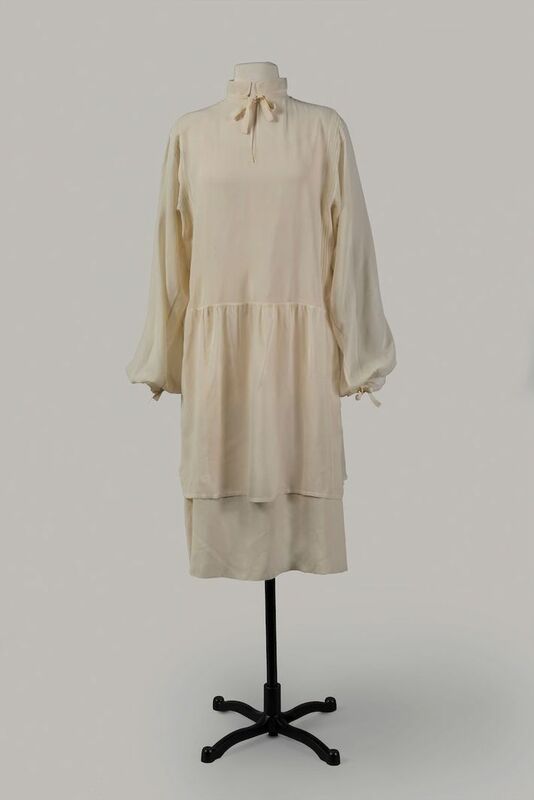 Dress (Tunic and Underdress), circa 1926. Ivory silk crepe. Georgia O’Keeffe Museum, Santa Fe, N.M.; Gift of Juan and Anna Marie Hamilton. Patio with Cloud, 1956. Georgia O’Keeffe, Oil on canvas, 36 x 30 in. (91.4 x 76.2 cm). Milwaukee Art Museum; Gift of Mrs. Edward R. Wehr.